High Fives all around! 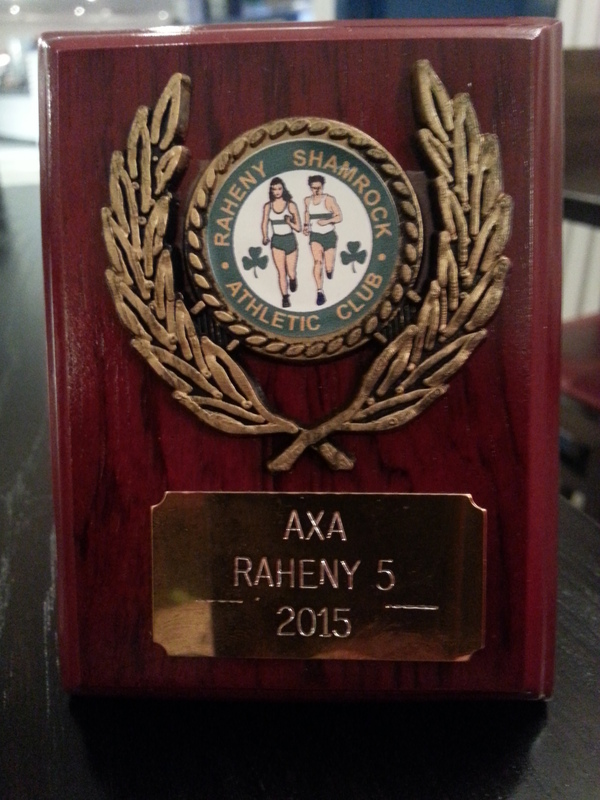 Raheny 5 race report! 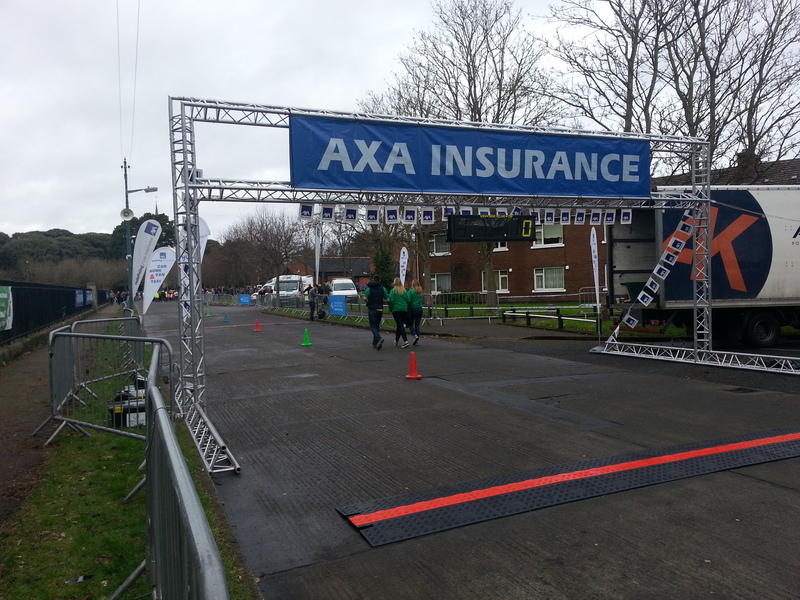 Yesterday I ran my 10th ever race, the AXA Raheny 5 mile road race. It has been one of my more enjoyable races to date and was both challenging and fun. Going into the race I wasn’t feeling too confident, having been sick again over the Christmas holiday and having run far less than I planned in the first couple of weeks of January, I was questioning my level of fitness and whether or not I could run the whole thing. I never once thought of not running this race though, just wasn’t sure what my race strategy would be. Having never run this race before I didn’t know the route very well but I did myself no favours by not even looking up the route beforehand. It wasn’t until the Friday before the race that I learned a bit about the course, particularly a big hill near the end of the race. Knowing about that helped and I decided on the day that I would do my best to run to the hill, treat myself to a walk up the hill, then run from there to the finish, only walking if I really had to. The race start was for 3pm so I had plenty of time to get ready in the morning, fuel up with my usual pre-race porridge and get some water into me. I had to take a bus and train to get to Raheny so I left the house with loads of time to spare, just in case anything went wrong. I wasn’t the only one with that plan apparently, as there were loads of people in running gear on the train. I sat near a woman dressed for racing and struck up a conversation with her. She knew where to go to get our race numbers so I followed her there; which was a big relief as I didn’t have to worry about being in an unfamiliar area. Thank you! Picking up my race number was easy, then I wandered over to the start to check it out. The gantry was both the start AND finish line, as the course was a big loop, so I took some photos and tweeted, wondering when I’d see the finish line again and what time it would be showing. Watching the kids races before the main race was really inspiring; it was amazing to see such young runners racing up and down the road and most of them looking so serious about it but also enjoying it. It was a lot of fun to watch and it really contributed to the all around great atmosphere. I wasn’t expecting this race to be so busy, but the large number of runners also made the atmosphere really great. It helped get me into a better frame of mind for the race. I also bumped into a couple of friends so exchanged some ‘good lucks’ which is always nice. This race was really well organized, except for the ‘Zone 2’ pen which ended up not even being used. Because of the large numbers of people the start was split into two waves, the under 40 minute runners and the over 40 minute runners. I understand this was something new they were attempting this year but it didn’t appear to have worked. It was a bit confusing for the few of us who showed up at the pen! Well, the Zone 2 pen was not only empty, it was tied off with tape, blocked with spectators and vehicles and there were no stewards to ask what was going on! Myself and a few other runners ended up going through a gap in the barriers to get onto the main road and joined the rest of the pack heading for the start. I think what happened was the wave 2 runners just lined up behind all the wave 1 runners without anything being announced. Anyway, after getting onto the road and under the starting gantry my race with myself began in earnest. I really wanted to beat my previous race time, and I wanted to run this race in as close to an hour as I could but given my lack of quality runs this month, I would be happy to come in under 1 hour 10 minutes. I settled into a slow but steady pace soon enough, but as usual I felt very much on my own as the main pack had disappeared. I wasn’t totally alone however so that was an improvement on past races. I was happy to see runners ahead of me so I knew I was on the right route at least! I ended up having to run on the footpath from about mile 2 or so as the roads were all open to traffic once the main field passed by. Again, I am not surprised as this happened to me before at a different race. Still, I am determined that one day I will run a road race ON the road! Running on the footpaths, having to wait for traffic and dodge pedestrians…I wonder how many seconds I could shave off my time if I didn’t have to contend with that? That’s a question I will have to answer as I get faster! I felt pretty good during the race; I knew I was running a good pace and decided not to check my Garmin at all because I didn’t want to pressure myself too much. As long as kept running I was happy. From about mile 3 it started getting tough and for some weird reason I felt my arms going numb and a kind of tingling in my fingers. Very strange! I’m not sure why that happened but I kept on regardless, determined to keep up a running pace. Coming downhill to the coast road was my favourite part of the run, not only for the downhill but for the view. Wow. It was stunning! I would have stopped to take a picture but I didn’t want to stop. Running the coast road wasn’t easy, on a kind of footpath with cars parked all along it, but I got past all that and then came to the dreaded hill. I’d done really well up until then but knew I could use the walk so I slowed down a bit and that’s when something happened that’s never happened to me before. A woman who had been running behind me caught up with me and said ‘no, don’t stop! You’re my pacer! You’re setting a great pace!” Me?! Yes, me!! I didn’t want to let her down so I power walked up the hill while she ran beside me; we chatted for a bit about the race and running and at the top of the hill I picked up my pace and started running again. We stuck together for a bit, which was a novelty for me as I have never run with another person before. It really kept me going! When I was feeling the strain and tempted to slow down or walk, she was beside me and I knew I just had to keep running. Mile 3 to the finish were my toughest miles; everyone, marshalls and finishers kept saying ‘it’s just around the corner’ but really, it wasn’t! Of course I could hear the announcer getting louder as I got closer to the finish and then I did turn a corner and there it was but oh heartbreak of heartbreaks there was a little loop to run before I could hit the homestretch! Being that close to the finish line, but so far away was mentally the toughest challenge of the race. Huge, massive thanks to everyone who stayed on to cheer at the end! That big cheer carried me up the road and gave me that extra charge of energy I needed. Also, most amazingly and wonderfully, my personal trainer, Michael of @myptdotie had finished the race well ahead of me and stuck around to see me finish. I turned the penultimate corner and there he was waiting for me with a big cheer. It meant so much to me to see a familiar face when I was struggling, I’ve never had anyone I know cheer me at a race before. It made such a difference! He ran with me for a stretch then left me to sprint for the finish. And sprint I did. I could see the clock ticking at around the 1:11:00 mark and I knew I had to finish fast if I was going to make it with a chip time of under 1 hour 10. It felt amazing to put on that burst of speed, to know I had that energy left in my legs. For me, it was a fantastic finish to a challenging race. My official chip time was 1:08:17 which is 3 minutes faster than my previous 5 mile race time. I am so, so proud of myself for that! I also owe a big thanks to Miriam, who ran with me for the last two miles; her presence really motivated me to keep running and not stop. You are a big part of what got me across the finish line, so thank you!! The post race goodie bag is probably the best goodie bag I’ve ever gotten from a race. Unfortunately it was filled with chocolate, caffeine drinks and fizzy drinks and since I don’t eat chocolate or drink caffeine or fizzy drinks I had to give much of it away. Love the protein bars and digestives though! Those I can eat! I missed the prize giving as it was over by the time I finished, and I didn’t even know there was tea/coffee in the GAA club house. Oh well, I will know for next year! All in all it was a great race and I will definitely run this again next year! Big thanks to the people of Raheny who came out to cheer us on and to all the volunteers and organizers for putting on such a great race! Well done and I would have taken your goody bag! I haven’t run the Raheny 5 yet – last year I was injured and this year I was in Tralee at the first parkrun there. But I have the impression that the Raheny 5 is uncomfortably crowded, and it’s a pity that the roads re-open so soon.